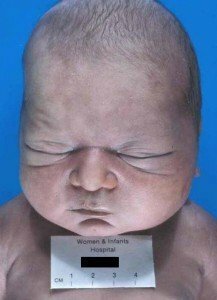 Oligohydramnios is a disorder that occurs in pregnancy and is characterized by an amniotic fluid deficiency. 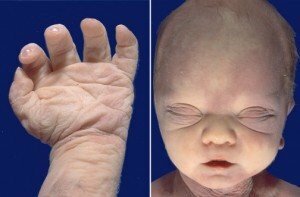 The fetuses with this condition have less than 500 ml of amniotic fluid . The prevalence of this disease can be up to 6% of all pregnancies . Persistently wet sensation in case of a ruptured amniotic sac, due to leakage of vaginal fluid. Apparently smaller appearance of the belly than what should be at a certain gestational stage. In some cases, Oligohydramnios may occur due to leakage of amniotic fluid through a small ruptured spot in the amniotic membranes. This is quite common during the time of delivery although it may arise at any stage of pregnancy . Kidney defects (polycystic kidney, renal agenesis) or absence of kidney in a fetus may also affect urine production. Inheritance (autosomal recessive/autosomal dominant) of abnormal genes by a baby may also be a cause. Risk of amniotic fluid deficiency is higher in women carrying multiple fetuses or twins. Oligohydramnios may also arise due to Twin-to-twin transfusion syndrome, a disorder characterized by high fluid levels in one twin and severe lack of amniotic fluid in another. Amniotic fluid deficiency may arise due to placental abnormalities such as a partial abruption, which results in peeling of the placenta from the inner uterus wall . Acute complications may arise from stoppage of urinary production due to abnormality in the placental blood and nutrient supply. It lets doctors assess amniotic fluid levels in the deepest uterine sections. It is one of the most common tests  available for amniotic fluid volume (AFV) measurement. Oligohydramnios is diagnosed in 4% of approximately 8% pregnant women with amniotic fluid deficiency. It helps to spot any rupture of membranes (ROM) that might have caused Oligohydramnios. Amniotic fluid deficiency in the uterus can be detected by blood tests, such as maternal serum screening. These also help understand the risk of an infant to be born with congenital disorders (Spina bifida, Down syndrome etc). This should aim at distinguishing the signs of from those of similar disorders like cystic dysplasia, as is done during ultrasound examination. Normalcy of amniotic fluid levels are maintained by infusing sodium chloride solution into the amniotic cavity by use of an intrauterine catheter . It includes diverting the fetal urine into the uterus in sufferers of fetal obstructive uropathy – a condition which results in oligohydramnios. Amniotic fluid levels can also be effectively managed with Vesico-amniotic shunts, although their effectiveness in maintaining proper pulmonary and renal functions is still doubtable. This involves injecting fluids through amniocentesis before delivery. It helps physicians understand the fetal anatomy better so as to help them to manage the problem better afterwards. The disorder, however, recurs within a few weeks after injection. The body of a mother is rehydrated and amniotic fluid levels are increased through the use of oral and IV fluids. Mothers are recommended to increase their fluid consumption. Complete bed rest, along with proper fluid intake, helps boost amniotic fluid production by increasing the intravascular space . 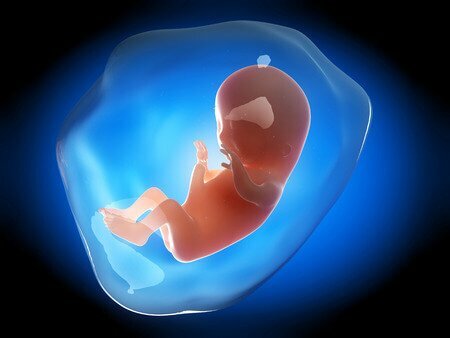 Only in severe cases during the first trimester, termination of pregnancy may be recommended. The outcome is very poor where pulmonary hypoplasia is associated. The earlier Oligohydramnios develops in pregnancy, the poorer the prognosis is. The risk of recurrence in future pregnancies depends on the exact causes . Fetal mortality rate varies between 80-90% in cases where Oligohydramnios is detected as late as during the second trimester. The images below show the appearance of Oligohydramnios sufferers. The ICD9 Code of the disorder is 658.0.